In my first post on this subject, I poked a bit at how one might represent TEI in HTML without discarding the text model from the TEI document. Now I want to talk a bit more about that model, and the theory behind it. I may at the end say irritable things about Theory as well, if you can stand it until the end. I humbly beg the reader's pardon. 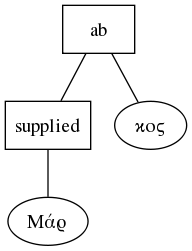 A supplied section begins in the middle of the third word from the end of line five, and continues for the rest of the line. The last word is itself broken and continues on the following line, the beginning of which is also supplied, that section ending in the middle of the second word on line six. This is a mess that would only be compounded if we wanted to mark off words. This may all seem like a numbing level of detail, but it is on these details that theories of text are tested. The text model here cares about editorial observations on and interventions in the text, and those are what it attempts to capture. It cares much less about the structure of the text itself—note that the text is contained in a tei:ab, an element designed for delineating a block of text without saying anything about its nature as a block (unlike tei:p, for example). Visible features like columns, or text continued on multiple papyri, or multiple texts on the same papyrus would be marked by tei:divs. This is in keeping with papyrology's focus on the materiality of the text. What the editor sees, and what they make of it is more important than the construction of a coherent narrative from the text—something that is often impossible in any case. Making that set of tasks as easy as possible is therefore the focus of the text model we use. What I'm trying to get at here is that there is Theory at work here (a host of theories in fact), having to do with a way to model texts, and that that set of theories are mapped onto data structures (TEI, XML, the tree) using a set of conventions, and taking advantage of some of the strengths of the data structures available. Those data structures have weaknesses too, and where we hit those, we have to make choices about how to serve our theories best with the tools we have. There is no end of work to be done at this level, of joining theory to practice, and a great deal of that work involves hacking, experimenting with code and data. It is from this realization, I think, that the "more hack, less yack" ethic of THATCamp emerged. And it is at this level, this intersection, this interface, that scholar-programmer types (like me) spend a lot of our time. And we do get a bit impatient with people who don't, or can't, or won't engage at the same level, especially if they then produce critiques of what we're doing. As it happens, I do think that DH tends to be under-theorized, but by that I don't mean it needs more Foucault. Because it is largely project-driven, and the people who are able to reason about the lower-level modeling and interface questions are mostly paid only to get code into production, important decisions and theories are left implicit in code and in the shapes of the data, and aren't brought out into the light of day and yacked about as they should be. There has been a fair amount of discussion of late about TEI either having a standard HTML5 representation or even moving entirely to an HTML5 format. I want to do a little thinking "out loud" about how that might work. So how might we take this line and translate it to HTML? First, we have an <lb> tag, which at first glance would seem to map quite readily onto the HTML <br> tag, but if we look at the TEI Guidelines page for lb (http://www.tei-c.org/release/doc/tei-p5-doc/en/html/ref-lb.html), we see a large number of possible attributes that don't necessarily convert well. In practice, all I usually see on a line break tag in TEI is an @n and maybe an @xml:id attribute. HTML doesn't really have a general-purpose attribute like @n, but @class or @title might serve. On <lb>, @n is often used to provide line numbers, so @title seems logical. Now <gap reason="lost" quantity="16" unit="character"/> is a bit more of a puzzler. First, HTML's semantics don't extend at all to the recording of attributes of a text being transcribed, so nothing like the gap element exists. We'll have to use a general-purpose inline element (span seems obvious) and figure out how to represent the attribute values. TEI has no lack of attributes, and these don't naturally map to HTML at all in most cases. If we're going to keep TEI's attributes, we'll have to represent them as child elements. We'll want to identify both the original TEI element and wrap its attributes and maybe its content too, so let's assume we'll use the @class attribute with a couple of fake "namespaces", "teie-" for TEI element names, "teia-" for attribute names, and "teig-" to identify attributes and wrap element contents (the latter might be overkill, but seems sensible as a way to control whitespace). We can assume a stylesheet with a span.teig-attribute selector that sets display:none. Like HTML, TEI has three structural models for elements: block, inline, and milestone. Block elements assume a "block" of text, that is, they create a visually distinct chunk of text. Divs, paragraphs, tables, and similar elements are block level. Inline elements contain content, but don't create a separate block. Examples are span in HTML, or hi in TEI. Milestones are empty elements like lb or br. TEI has several of these, and HTML, which has "generic" elements of the block and inline varieties (div and span) lacks a generic empty element. Hence the need to represent tei:gap as a span. I suspect I'm missing the point here, and that what the proponents of TEI in HTML are really after is a radically curtailed (or re-thought) version of TEI that does map more comfortably to HTML. The somewhat Baroque complexity of TEI leads the casual observer to wish for something simpler immediately, and can provoke occasional dismay even in experienced users. I certainly sympathize with the wish for a simpler architecture, but text modeling is a complex problem, and simple solutions to complex problems are hard to engineer.